There are several ways to integrate branding within office design. With careful consideration, designs can also reflect a company’s ethos and unify employees. An office is a statement about a business’ values and branding. Visitors will pick up on the subconscious messages that you’ve weaved, intentionally or not, into the office design. This is why in the past, companies would go to great lengths to implement branding within entrance and exit ways. However, there was very little attention paid to the internal working areas of the office. 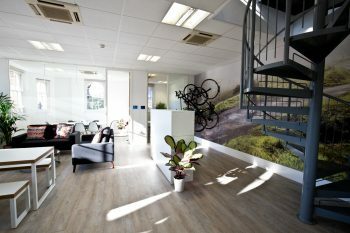 There are however ways that you can combine both functional office designs and corporate branding throughout a building. For some, the colour of the floor is not the first thing they notice. However, even if people don’t pay active attention to it, they will notice it subconsciously. 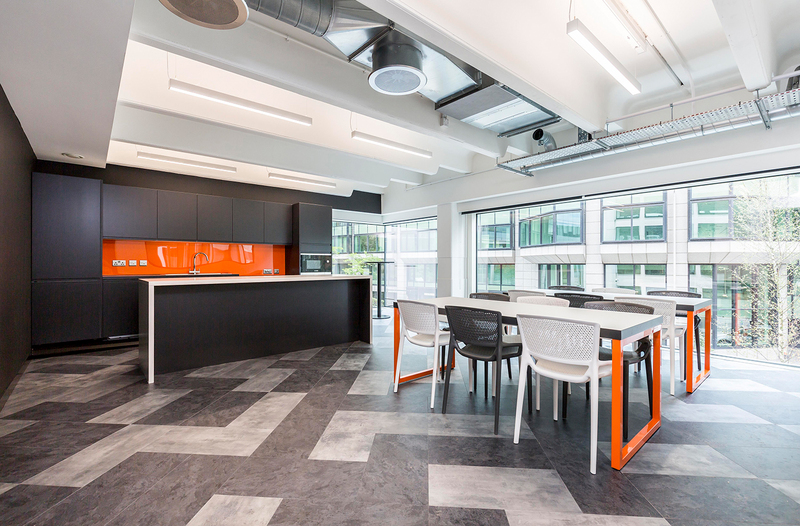 Using brand colours in commercial flooring choices shows great attention to detail and is likely to have greater stand-out. 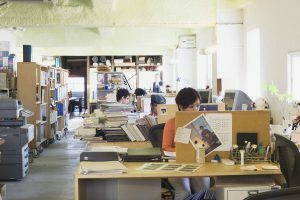 Whenever you’re looking at office design, you should think about how a veteran employee would give a tour of the building. Where would they start, what are the points of interest and what paths would they take? The natural stop points and typical pathways are key areas where branding should be. Branding isn’t just about colour it is also about the messages and concepts the business wants to convey. When designing an office, it is worth thinking about the main message that you want the business to communicate. Is it about inspiration or customer service? These important messages should be at key points in the office which see high traffic. You can also segregate messages for staff and those for visitors. Angelist used a mural of Steve Jobs and Steve Wozniak to inspire and connect their love of innovation and startups to two of the most successful tech entrepreneurs. This reflects their mission to help startups find their funding and talent for success. While many businesses spend budgets on leaflets and other publications, there is one area that is often missed out – the office design. 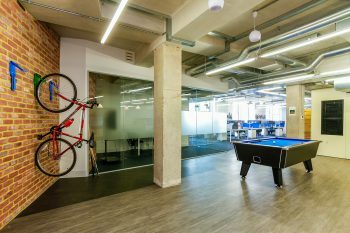 Yet by getting everything from commercial flooring to wall murals matching corporate branding, an office can become a way to advertise a business. More importantly it can also help unify the team around a company’s brand values.